In as little a one month, you can be enjoying a brand-new, professionally installed front yard landscape and backyard retreat. Backyard decks and DIY landscape projects can languish for years in various states of completion. 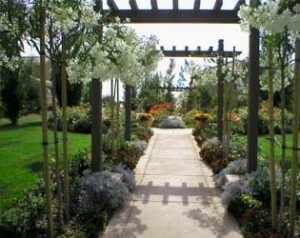 With professional installation, your landscape or handscape project will be done quickly and done right. As nursery, design group and installation company, Green Acres completes projects with competitive pricing and greater efficiency. Depending on your timeline, landscape and hardscape projects can be completed in less than four weeks from the initial consultation to project completion. If you’re getting ready to sell your property, the Green Acres design and installation team can quickly and effectively transform your landscape and bring out your home’s curb appeal. With professional landscape installation from a large nursery like Green Acres, you have access to a large selection of locally adapted plants that are guaranteed to grow. Before planting, installers prepare soil for improved drainage and superior plant growth. Knowledgeable professionals remove attachments and properly prepare ball in burlap trees for unrestricted growth. With access to dedicated heavy equipment, professional landscape installers can deliver and plants, high-quality trees, large specimens, and mature landscape plants. Using boom trucks, installation teams can plant 30-foot palms in cramped spaces and compact courtyards. Installers can also use backhoes for digging, grading, and manipulating the natural terrain. Professional landscape installers specialize in delivering materials and constructing custom landscape and hardscape features. Raking and distributing topsoil and mulch is tiresome work especially after a day at the office. With professional landscape installers, you can have mulch or topsoil delivered and applied in one day. Working with a dual supplier and installer, homeowners can have pavers, bricks, Belgium blocks, slate, natural river rocks, and supplemental items delivered directly to the property or construction site. Green Acres offers no-hassle delivery options for sod, topsoil, gravel, mulch, and many other landscape materials. To keep your lawn and landscape looking its best, professionals at Green Acres also install irrigation systems, landscape lighting, and many secondary features that enhance overall appeal and bring together the finishing touches for a flawless landscape design. Irrigation and low-voltage landscape lighting systems can both be installed with minimal impact and non-invasive construction techniques. In most cases, sod can be replaced for seamless installation without reseeding. If necessary, professional installation teams touchup any areas disturbed by equipment or installation. Investing in professional landscape installation services ensures your vision is executed by trained professional with no back-breaking labor necessary. For easy installation and flawless results, consult landscape professionals at Green Acres who will help create a customized plan based on your specifications. Working with a professional installation team will turn your vision into reality. Homeowners who invest in professionally installed landscaping benefit from increased home value, faster selling-time, and a more enjoyable and functional outdoor space.